It’s taken me a while to feel inspired to cook spring recipes due to the move/renos and the on-again, off-again spring weather (ahem, fresh blanket of snow last week), but now I can say it finally feels like spring. Today also happens to be Earth Day which is even more reason to eat some plants. I love this time of the year and it’s been fun experiencing spring with a backyard again! Oh how I missed having a backyard. The tulips and daffodils are coming up, the frisky red squirrel is trying its best to take down our bird feeder, and Sketchie is sniffing the spring air through the screen door while the birds, bunnies, and squirrels drive him insane. It’s a good time of year. Now that we’re starting to get settled into the new house, I’m finding my way back to the kitchen and away from the Indian food take-out menu (at least some of the time). The kitchen is slowly starting to feel like home, complete with fresh tea and vanilla extract stains on the laminate countertops (those were not designed for an avid cook, I tell you! ahhh) and the padded chef’s mat underneath my feet. Every time I cook in there, I get a bit more familiar with my new space and I find myself cursing less and less as I search for misplaced kitchen tools. Rome wasn’t built in a day, you know. This recipe is an ultra-fresh take on pasta primavera – a spring vegetable pasta dish. Rather than relying on heavy pasta for a spring recipe, I decided to lighten things up with a fresh carrot “pasta”, which is simply julienned carrots. Obviously, the carrot pasta tastes nothing like actual pasta, but I promise you won’t miss it one bit! You’ll be feeling light and energized after eating this rather than sleepy and sluggish. I plan on making a seasonal summer version and a fall version to follow so keep your eyes peeled for those recipes later this year. So what’s in this delightful spring dish? As per my usual style, it’s loaded with fresh vegetables. Leek, garlic, asparagus, and peas are sautéed with some pink salt, pepper, and olive oil. Ignore the snap peas in the photo above, I opted not to include them in this dish (but feel free to improvise if you’d like). Then I whipped up an incredible batch of pesto – my nut-free Sun-dried Tomato Basil Hemp Pesto adapted from the pesto in my cookbook. Kale can be used instead of basil if you prefer. It’s packed with protein thanks to the hemp seeds and it’s completely nut- and dairy-free without giving up that creamy, luxurious texture that makes pesto so great. Once the vegetables are tender, I stir in the pesto. This is when things go from good to mind-blowing; a simple spring veggie sauté is transformed into something decadent. It’s one of those I-can’t-stop-eating-this-straight-from-the-skillet dishes. Hold me back! If you can share, it’s the perfect amount for two veggie-loving people – decadent but light, simple to make, and packed with veggies. I swear I felt the baby bust out a flutter kick dance recital after I ate it. 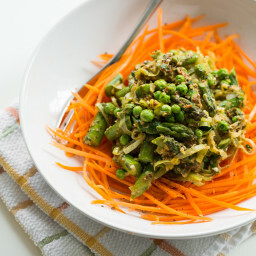 This is my take on a lightened-up version of pasta primavera - a spring vegetable pasta dish. Rather than using pasta, I opted for fresh carrot pasta which is simply carrots that are julienned into very thin strand-like noodles. This is the julienne peeler that I use. The vegetables are coated with a decadent, but nut- and diary-free sun-dried tomato hemp pesto and it transforms this dish into something decadent and special. 1 cup fresh or frozen peas. With a julienne peeler, peel the carrots into thin, spaghetti-like strands. 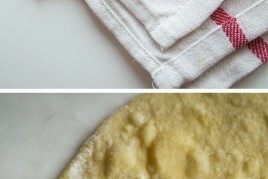 Cover with a damp tea towel or damp paper towel to avoid it drying out. Add oil to a large skillet or wok, and preheat over medium. Add sliced leek and garlic and saute for 3-4 minutes, until soft and translucent. Add a couple pinches of salt and several grounds of pepper. Add the asparagus to the skillet and saute for around 8 minutes more, until tender. Increase heat if necessary. Finally, stir in the peas and cook until heated throughout. Meanwhile, make the pesto. Add the garlic into a food processor and process until minced. Now add in the basil and sun-dried tomatoes and process again until smooth. Finally, add the rest of the ingredients and process again until combined and smooth. Stir all the pesto into the vegetable skillet mixture and cook until heated throughout. Season to taste. Serve the vegetable pesto mixture on top of the carrot pasta. Note: If you'd like to add more protein to this dish, I recommend French green lentils. Edamame would work nicely too. If I missed any of your reviews please let me know and I’ll be sure to add them to my book page. Please let me know how that goes! I’d love to make this recipe ahead of time for work, but I’m not sure how well the dish would reheat. I just got a spiralizer and was wondering if you think zucchini noodles would work just as well as carrots? Great recipe and I hope your move has gone well! I’ve been following your website and your recipes for a while now, and I’d love to buy your cookbook. The only problem is that it is appearently not available in the belgian iTunes store… Is it a problem that can be solved ;)? Do I have to change my settings in iTunes, I absolutely have no clue? All the best and the best wishes for your expanding family! The book is also available from the Book Depository if you are outside of North America: bookdepository.com/Oh-She-Glows-Cookbook-Angela-Liddon/9781583335277 They have free worldwide shipping. If you want a digital copy you can buy that from Amazon.com. As for the Belgian itunes store I will have to follow up with my pub. on that one. Hope this helps! Thank you so much for the quick reply! No problem :) Hope it all works out for you! Thank you anyway for the lovely work you do! God bless you. aww I’m so happy to hear that Johanna! Thank you. As for subbing oat flour, it really depends on the recipe so I can’t say it will work for sure, but it should be ok in most recipes. Did you have any recipes in mind in particular that you want to try out right away? If so, let me know and I’ll see if I have any info to provide. I was thinking of making the “Out-of-the-door chia power doughnuts”(p.41) and “the super-power chia bread” (p.229). We have quit a lot of millet flour and buckwheat flour in stock these days ;) could I use one of these? He will be so happy having something different (just like the other kids) to eat than fruit during recreation time. I think I am actually drooling here. I have been all about asparagus this year and this dish not only uses it, but looks like I could inhale it without it. I’m so glad you’re getting back into the kitchen because my tastebuds will be thrilled. You’ll have to do a post on the new place and some before and afters. I love that stuff. So glad you’re getting settled and it definitely takes time to the find the rhythm in a new kitchen! It looks absolutely amazing. I will be making it tonite for dinner! I’m wondering if this could be made eliminating the hemp seed? This looks delicious, although I must admit I’m a bit afraid of so many carrots together at once! I may have to give it a try with a different veggie! Oh I know how you feel getting the new kitchen set up just the way you like it. This recipe looks beautiful! I don’t use leeks enough, I will most definitely pick up these ingredients to whip this up for dinner tonight! That looks so yummy!! I’m definately making this soon. I think I will substitute fresh green beans for the asparagus since my hubby won’t eat asparagus. Perfect colors for spring! I love how the new house is inspiring you to be creative in the kitchen! I just reviewed the book and also have a giveaway running through this week on the blog! Thanks so much for your lovely review! So happy you are enjoying the book. :) I’ll add yours to the reviews now. I love this recipe. My spiral cutter is one of my favorite kitchen tools. Lovely recipe!!! This looks so good – especially the pesto! I love using raw veggies in the place of pasta! You’re totally right – its much lighter and leaves you with way more energy! Will try this with my spiralizer!! This looks amazing and perfect for Spring! I went to Maoz (in NYC) today for lunch. I’m not sure if you’ve been there, but it’s 100% vegetarian with loads of vegan and gluten-free options. But it’s better known as simply a good falafel joint. Anyway, I got vegan rice pudding there, and it was so perfect on this slightly warm day. It’s kind of cinnamony and super creamy. I thought of you right away thinking that perhaps you had already posted a recipe like this, but don’t see one. Do you happen to have one? Also, if you haven’t been to Maoz, you should. It is so amaaaaazing. Hey Sara, I can’t believe it but I’ve never made a rice pudding before! I should fix this :) I’ll have to try out that restaurant next time I’m in NYC! I recently just started eating hemp seeds and I really like them. Cant believe how much protein is in one serving! The more I eat vegan dishes during the week (I still eat chicken, turkey, and fish sometimes) the more my body has been craving plant based foods. Can’t wait to try this recipe! Could you please give me permission to post one of the recipes from your book (summer harvest tortilla soup) on my blog? I’m currently working on a review post for your cookbook. Angela – you have such a talent for making vegetables look so appetizing! You’re an inspiration. This dish looks flavorful and so delicious! Julienne peeler, julienne peeler. I need one of those. Love this lightened up version–fresh & light feels like the perfect thing to be eating this time of year. looks amazing! just wondering about heating up the hemp hearts, I read that this can turn the good fats into trans-fats? have you heard anything about this before? Just got my cook book today in the mail! Can’t wait to sit down with it and a cup of tea! It looks beautiful! I just happen to have all these ingredients and didn’t know what to make for dinner. I have the sauce made and the rest sautéing. Smells great. Thanks. Yummmm! This was delicious and very simple. I replaced the peas with edamame as I had some handy in the freezer, and I swapped the carrot for pasta (I realise that sort of defeats the point, but I love me some pasta!) It was very flavourful and moreish – definitely recommend it! I only wish that this recipe made twice as much pesto! As a girl who loves her sauce/sun-dried tomatoes/basil, I was disappointed there wasn’t more. Note to self for next time! I was flipping through my tabs when I saw the first photo and exclaimed “Oh damn, that looks tasty”! Can’t wait to try it! Are you still in GTA or you guys moved somewhere further? Made this wonderful dish tonight. So easy and SO DELICIOUS! Thank you!!! This looks so flavorful! I love cooking with sun-dried tomatoes. This is so delicious looking! Oh this sounds so tasty and creative! Saving to try soon! Thank you for this!!!! I have been craving a pasta dish and this definitely will satisfy!!!! I’m off to the store for some sun dried tomatoes today!!! I JUST got the julienne peeler when I ordered your cookbook off of Amazon last month and I love both (clearly the second the most haha), so this sounds perfect to put that peeler to use more! Hi Angela! My birthday was on Easter so my mom and I decided to make a vegan feast for my family. We loved your life affirming nacho dip and sundried tomato pesto! The cookbook has been Amazing so far we can’t wait to try more! Do you think grape tomatoes would work in this recipe? I happen to dislike the taste of sundried tomatoes. you might be able to skip the sun-dried tomatoes all together – i’d worry that regular tomatoes would make the pesto too watery? this looks so good – certainly glowing with healthy and yumminess! Hi Angela! 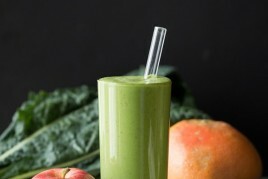 This recipe looks perfect for Spring, I love all the green! I made this for dinner last night. Didn’t have hemp seed so I substituted pistachio nuts. It was fabulous. Thanks for such a tasty meal. So glad you enjoyed it Robbie! Thanks for your feedback. Thank you soooooooooo much for all your delicious recipes. I most recently been trying to become 100% vegan ( can’t say I have not cheated once in a while) but your amazing ideas of food combinations makes it easier to get back on track without sacrifycing my demanding taste buds (all about great tasting recipes). Easy, delicious and nutricious!! Thanks again! Do you accept followers recipes for your website? Reading about all the veggies in this dish… leek, garlic, asparagus… my mind just suddenly pasted in ‘deliciousness’, right there. this looks sooooooooooooo good! cant wait to try it out! so pretty and looks yumm! Hi, Angela! This looks so good I’m going to have switch up the week’s menu and make it tomorrow night! On a unrelated note: I am making the double chocolate cake from your cookbook and have a question about the sugar. What type of cane sugar did you use? Not the brand, but the grade. Did you use a fine sugar or the larger stuff? The one I have is very coarse, like kosher salt, and I’m afraid it will not fully dissolve and the cake will have crunchies in it. Am I paranoid? Hey Stephanie, You might be referring to turbinado sugar? That’s very coarse sugar. I used the fine stuff. To be honest I haven’t tried a coarse sugar in a cake so I dont know if it would dissolve or not. Let me know how it goes! Yes, turbinado sugar. : ) It turned out very well, thank you! I opted to heat the almond milk, sugar and coconut just until the sugar melted and it did the trick very nicely. Unmelted, it would have been very crunchy. So, I just posted a brief review, recipe, and giveaway on VeganYumminess.com. :) Giveaway for the Oh She Glows Cookbook ends next Sunday night at midnight (CST). Happy Veg Week! Thank you so much Lindsay! I will be sure to add your review to the book page. I love the fact you call it “Glowing Green” because the positive flowing name is the salad topper on top! Gorgeous green photos :) I am loving asparagus right now too. It’s perfect! I just returned from my Spring Break in France and Italy where I spent 10 days eating pasta, pizza and bread for breakfast, lunch, and dinner (not only are they delicious options, but always the cheapest too, and I am on a student budget) so right now I need a carb break haha. However, this recipe has me itching for more pasta! It looks incredible and like an amazing combination of greens and pasta! I can’t wait to try it when I return home and have access to my own ingredients! Any thoughts on whether onions would be tasty instead of/in addition to the leek? Yes I think onion would be a fine substitute! Just an update, tried it last night. The onions worked great! Also didn’t have hemp seeds but used pine nuts and nutritional yeast in the pesto as well as swapping the julienned carrots for spiralized zuchinni and it was excellent! Great swaps – thanks for your feedback Brett! Made this for dinner last night and it was SUPERB! So fresh-tasting, light, yet hearty. Amazing! This will definitely become a regular dish in my household! … April 24th and I’ve been making your recipes every day since the 1st, which adds up to about 80% of all my eating this month. I already feel better and the 20% of times I’ve “slipped” were because I was lazy and not prepared! I just wanted to say that besides the mouth-watering deliciousness of all your recipes, the other thing that I really appreciate about them is the availability of all the ingredients. I live in northern Ontario and haven’t yet run into a case where I couldn’t easily buy them. There’s nothing rare or intimidating about any of it! That means a lot to me. Hi Debra, Thank you so much for your lovely note. I’m so happy to hear that you are enjoying so many recipes! This looks so good. I keep scrolling back and forth with the photos. I wish they served something similar in restaurants–crazy busy with a project and haven’t cooked in weeks! I did a review on your cookbook, Angela! And that’s an awesome idea for “pasta”! I’m definitely trying this. I ate aspargus today but my meal didn’t look that green. I like the way you cook and your meals are a grat inspiration. This recipe looks insanely delicious! Can’t wait to make this! I’ve ever made. Thank you for sharing!! I just made this recipe and seriously its unbelievable. I used coconut oil for the sautee and its so flavorful and absolutely delicious. Quite possibly the BEST thing Ive ever made …tasted for that matter that is vegan and gluten free! Well Done!!! Love this recipe! My 17 year old son could not eat it fast enough. LOVE all of your recipes, Ange, and have been eating totally plant based/vegan the past 2 years! I’ve been thinking about getting a spiralizer and now you are introducing me to the idea of a julienne peeler! Anyone out there using either of these tools and do you think both are useful? I’m intolerant to hemp. What would be a good sub? almonds would probably be nice – I would grind them up with the garlic first. Wow, your food looks amazing, healthy, and beautifully presented. Again another AMAZING recipe. I used a mix of carrots and zucchini noodles for the “pasta” base and it was great! Any suggestions if I want to substitute out the peas? I confess…I hate peas. Made your primavera. Both I and my boyfriend were very impressed. Substituted half of the asparagus for a cup of broccoli florets, which added a nice flavor. Thanks for sharing! I just made this and am feasting on it for lunch. Absolutely delicious!!! Is there a good substitute for the hemp seeds? I love them but I don’t have any at home right now. This recipe is amazing! Thanks so much. It will easily be a go to recipe for me to prepare. I loved LOVED it!! I don’t have a food processor (it’s on the ‘to buy list’ but i need a bigger kitchen first:)). would it be ok to make the pesto in my Vitamix? This will be one of my favorite dishes, I made it just as the recipe suggested on Sunday but look forward switching up the carrots with other options as suggested. My daughter and her little ones (14 months and 4 years old) also enjoyed it. Felt good to serve something so healthy that everyone enjoyed. This is honestly one of the best meals I’ve had since I transitioned to vegan. Thank you so much for this! I can’t get enough of it! Really popular and great flavor :) Thank you for another great one. Just stumbled on your website while looking for vegan breakfast ideas and I’m super glad I did! Your recipes look amazing and I was just in the process of figuring out how to save the pages of some of my favorite recipes when I found out through the comments that you have a book…! Definitely gonna be looking for it tomorrow but I wanted to know, what percentage of the recipes currently on your website are in this book? Just made this tonight and absolutely loved it. I mixed it with whole wheat orecchiette, kale and spicy italian chicken sausage and it was wonderful! Amazing on it’s own too (I ate a good amount out of the pan while I was cooking). Just made this tonight and OhEmGee it was tasty! This was the first recipe of yours that I have cooked since being introduced to the site by some friends a few days ago. Can’t wait to try more recipes! Thank you! I made this tonight for dinner. It was absolutely amazing! Just found your blog and I am an extremely happy camper! Just made this and it is FANTASTIC. My bf ordered pizza and was jealous of my food once I gave him a taste. You are a genius! I’ve made several of your recipes and they’ve all been great! Thank you! I tried this recipe last night, with the addition of some maitake mushrooms, and it is delicious! Amazing how well the carrots stand in for pasta…and they are sweet. I used a finer julienne. Hi Angela, I read your new recipes all the time and have made several dozen from your blog and cookbook….but I hardly ever see reviews from people who have actually made the recipes and comment about how much they enjoyed or didn’t like the recipes. Was wondering if you don’t post those or do people not comment after they have tried a recipe? Hi Barbara, You can often find the reviews/feedback of the recipe on the last page(s) of the comments. Hope this helps! SO GOOD OMG! Angela, thank you so much for your recipes. My boyfriend has had an easy time going vegan thanks to all your recipes. When I gave him this he said, “No one ever told me that vegan food was so delicious!” So thank you. It makes me so happy that he and I follow the same diet now. This looks FABULOUS! 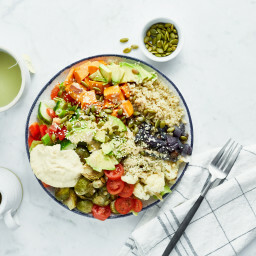 I am a newbie trying to eat mostly veggies, fruits and grains and limiting my dairy and meat intake and this is right up my alley. I love all the ingredients and I feel they are all easily attainable (and affordable!) which is usually a concern for me. Made this for dinner tonight, substituting farmer’s market scallions for leeks. I did serve it with pasta so my teenagers would have enough food to eat. It was a HUGE hit. I’ve had 2 requests for making it again soon and everyone cleaned their plates. I am having a hard time believing how many veggies my family has been eating. What more can a mom ask for? Thanks for sharing your fabulous recipes with us. Made this today, added a bit of nutritional yeast to the pesto, AMAZING! Even better, my initially sceptical other half loved it too. Thank you Angela! I made this last night and it was amazing. A perfect and light spring meal. I was skeptical about the carrots but they were the perfect pairing—I shredded them in my food processor. Just discovered this website and bought the cookbook at Costco. Every single thing looks great! We made this last night (with pasta instead of carrots) and it was amazing! The pesto with lemon and sun-dried tomato was unique and really set the dish apart. When we were eating it, we both said that we would order it in a restaurant! Made this dish and it was so delicious! Ate half of it for dinner and the rest cold for lunch the next day. Prefer it warm but it was delicious both ways. I’m a newbie but I tried this recipe and it was awesome! I couldn’t find leeks so I used a mix of regular yellow and green onions. I will be trying your chia seed pudding next!! This recipe looks just beautiful! And it’s such a fresh take on a traditional pasta dish. Can’t wait to try it – thank you! This recipe looks great. Looking forward to trying it tonight. How do you suggest adding the lentils? I made this pesto yesterday as a trial run for a dinner party I’m having Friday; it is so good! I made a wrap for lunch today with it and your hummus, along with various fresh and roasted veggies I had on hand. 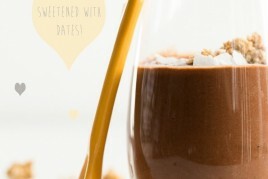 Last week I made your almost-instant chocolate pudding (such a hit! I have since frozen a bit of left-over coffee to try with the next batch! ), your roasted tomato-basil sauce, and your lemon-tahini dressing; all were delicious! I’ll try several more recipes from your cookbook this weekend; I’m totally addicted! Thanks so much for your blog/book; switching to veganism a few months ago has been really fun, with the added benefit of correcting my cholesterol without meds! Wow. WOW! Love this. I can’t wait to try this. Perfect for spring. Thanks for sharing!! This was delicious. The pesto is fabulous.We have made it 2x. We used raw zucchini the second time. I love all of your recipes that I have tried. My only complaint is that they seem to take much longer than what you have posted. Any advice. I am SO happy right now – just made this for dinner and my whole family thought it was so good! My first time using hemp seeds. Thanks for a great recipe – I’m excited to try more recipes from your site!!! Yum. I can’t wait to try this!! My husband and I follow a paleo diet and I was a vegetarian/vegan for the previous 3 years. I have a dairy and gluten intolerance as well. 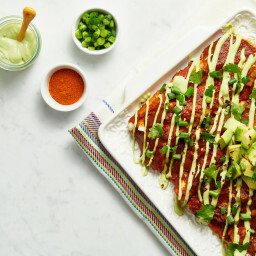 We have been trying to incorporate meals that are both vegan and paleo-friendly into our weekly routine to try to reduce the meat intake, so a recipe like this is perfect! I’m finding that A LOT of your recipes fit the bill. Thank you so much for the delicious ideas! I made this last night, and it was delicious! I ate so much of it, and felt great about it! Thank you! I made this tonight and it was soooo delicious. However the hemp seeds wouldn’t go smooth and stayed whole. Is that because of a crappy food processor or are they meant to stay crunchy? The taste is just so delicious, I’m so happy I found this! Definitely a keeper! I added garlic into the pesto, mmmm mmmm mmmmm! Thank you so much for sharing and I can’t wait to try other recipes from this website! I made this dish for my wife last night, and it was amazeballs!!! Seriously though.. Not to build it up too much, but we were thoroughly impressed, and I almost didn’t want to tell her how easy it was to prepare. It’s a keeper. So happy to hear that Todd! This was amazing! I loved the complexity of the green veggies together, and that pesto mixed in. Yum! I used a grater on my carrot and did a quick boil to heat them, but keep a crunch, and we loved it. Thanks for a great recipe. I was very surprised with the flavour of this dish. The pesto was truly delicious!! I am continually in awe of your creativity Angela, you are a genius! I just put this into cronometer and it provides 15.2g of protein per serving (as well as being mega-rich in vitamins and minerals), which is just over 1/3 of the RDA for women in one very light meal. So no need to fret. Protein comes automatically. But if you can’t resist, I reckon green broad beans would be more Italian than edamame and just as delish. Great recipe by the way. I’m a beginner learning to cook healthy meals for my parents, who are convenience food vegans. 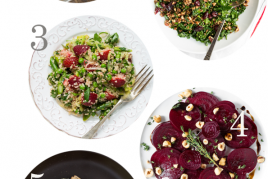 This site is a great resource for nutritious whole-foods meals. I’ll probably serve this over normal pasta and cook the carrots slightly to soften them. Any tips on how to reduce the garlic? They are both haters. Is it essential to the flavour? What about keeping the garlic in the pesto, omitting the it from the primavera and replacing it with a small onion and some more Italian herbs like parsley or oregano? Amazing! Love the addition of hemp seeds to the pesto. I made it with buckwheat noodles. Was hoping for leftovers, unfortunately that didn’t happen. Hi my fiancé is allergic to hemp seed. Can I replace it with something else? Thanks for these wonderful recipes. I tried the Glowing Green Pasta Primavera and everybody loved it. Easy to prepare and will make this again. I could not find hemp seeds so I used roasted unsalted sunflower seeds for the pesto. And I added chopped fresh mushrooms to the primavera. It was delicious. I just made this and had to come on here and post something about it. IT WAS AMAZING!! I didn’t even use a blender for the sauce, just added the ingredients at the end… sans the hemp seeds, was fresh out of hemp. But it still came out so amazing. The taste… And the colors… And the…EVERYTHING! Even my husband, a very non-vegan was amazed at the taste. I had to give him mine and came another for me. I cut the veggies in half for a single portion but made the sauce with the amount it called for… Worked out great! Such a good dish, I’ve made it now three times and without fail! Today am trying it with frozen corn as there was a shortage at the grocery store. Putting it on quinoa with some baked yams… yum! This mock-pasta is my favorite of all of your recipe! I have probably made it a dozen times. It’s pretty much perfect. Even though it is packed full of fresh veggie goodness it comes together quickly with little prep work and cooks up in a flash. It works very well with seasonal substitutions of pretty much any kind. The pesto can be made ahead of time and freezes well for an even quicker fix. This dish leaves me feeling sated but not too full or gross and pleases even the meat eaters in my life. Hubs used to fry himself a sausage on the side with it, but now he says this is perfect as is. I made this last night. The flavors were out of this world!! I had a carrot juice for breakfast so decided to use this bag of black bean pasta instead. The pasta got in the way of the sauce though. Next time I’ll use the carrots or zucchini. Sauce was amazing! I will double the recipe so I’ll have leftovers. Thanks!!! I really liked this, well everyone did. I didn’t use spiralized veggies I used real pasta and it was awesome. I made it exactly as written. I just discovered your website last week while browsing for a recipe for raw energy balls. I have been browsing your website ever since! I fed my kids & my sister the crispy quinoa cakes and it was popular. I had to make a second batch! I started 2015 with a cleanse and a decision to move towards a plant based diet. Being new to this, what’s the difference between hemp hearts and hulled hemp seeds? I used hulled hemp seeds. It was the only thing that my local health food store carried. Just made this for the first time. Could not get enough of that pesto! It’s amazing and super easy! Thank you! Absolutely Ah-May-Zing! I loved it and so did my carnivore husband. So delicious! This is an amazing veg dish – I make it without the “pasta” and since I can’t eat peas, I sub in brussel sprouts (about 1/2 lb) which I cook with the leek and garlic. So great! Love the pesto recipe too! The combination of veggies + amazing pesto was killer in this recipe. I made it with regular pasta (brown rice spaghetti) instead of julienned carrots. If I made it again, I would add more pasta to make the veggies go farther. I’m new to your Blog! I thought I would make Glowing Green “Pasta” tonight. I don’t have hemp seeds in my kitchen, but I do have hemp powder, flax powder and Chia seeds. Can I replace the hemp seeds with hemp powder; if so, how much? If not, what would you suggest I replace it with? Went to Trader Joes, got everything I needed, just unpacked, the cashier gal accidentally forgot my hemp hearts :C :C :C can I sprinkle Flax Seed over top at the very end? The hemp hearts are there simply to add protein, correct? I just made this! I used my spiral veggie cutter and made zucchini noodles. I added some salt and vegan butter to the noodles, and added a little rice vinegar to the pesto. Otherwise I followed it to the tee and loved it. My husband and I made this, the vegan Caesar salad, and the chocolate pudding for our Valentine’s dinner and this was out absolute favorite! You showed us that it is possible to make dishes that are just as good, if not better that any restaurant! Thank you for making our day special and delicious! Would recommend this recipe to all! I love it and I recommend you to try it! Wow this was so delicious! I first made the recipe as is, except I didn’t have peas so I used some spinach instead, and I used some Pappardelle noodles (similar to fettuccine) instead of the carrots (still grated some carrots into it). It was SO GOOD! I love this sundried tomato basil hemp pesto, it is so tasty you don’t even notice the cheese is missing. I made extra pesto and meant to save the rest to use on a sandwich with the buffalo hummus (for the “Ultimate 4-Layer Vegan Sandwich” http://ohsheglows.com/2013/09/04/ultimate-4-layer-vegan-sandwich/), but I devoured my pasta and leftovers, and made more pasta with the rest of the pesto. The second time, I sauteed some asparagus, onions, red cabbage, corn, sundried tomatoes, spinach, and a little parsley, and threw that in with some bowtie pasta and the pesto. I’m tempted to make the pesto again right away, it was that good! Definitely would recommend making this. Just made this for dinner and..
First time cooking with leeks, and discovered my family does not like them LOL. I might just use chopped regular onions next time but for me, this was amazing! I made just a few minor tweaks to this recipe (in order to use up ingredients already in my kitchen) and it was absolutely delicious! I substituted walnuts for hemp seeds and spaghetti squash for carrots. I used dry sundried tomatoes that I soaked in water for 10 minutes, so I added another tablespoon of olive oil to the pesto. When I make it again I’ll either make about 50% more pesto or use fewer veggies to intensify the incredible pesto flavor. I LOVED this recipe. I added pan fried paneer for a bit of extra protein and served it on top of spaghetti squash. It was surprisingly easy and unsurprisingly delicious. Omg so much yum! I’m eating this as I type! How much pesto does this make? We just made this and are eating it now. It’s delicious! Used broccoli instead of asparagus since I don’t like asparagus, spiralized the carrots and the sundried tomatoes were not oil packed. The fresh basil and lemon make it quite flavorful. I have been following your blog since January–thank you so much for your delicious recipes and sweet commentary! this is one of my favorites, I have made it as is and sometimes I will put it on top of spaghetti squash. I made this tonight. (I served it with zucchini noodles). It was amazing! My very picky husband deemed it one for the favorites list! Thanks, Angela!! Delicious! My husband and 2 year old daughter love this dish. I made it with edamame for the extra protein, and it was so filling, we could hardly finish it! I can’t wait for your new cookbook! I made this phenomenal dish last night – it truly was decadent. Two suggestions: I don’t think the extra olive oil is necessary in the pesto… the sundried tomatoes had enough (if you are concerned about fat). Also, I steamed the carrots slightly so they would be warm, and I wasn’t excited about the raw carrots… and they were fantastic and bursting with flavor. Overall an awesome dinner! I doubled it so I could have some for lunches… YUM! I loved making this recipe! This is a non-vegan household and I was looking to introduce some vegan recipes. It was fun and easy to make! I even got the pickiest eater in the house to say he liked it! My daughter and I made our second recipe from your site today. We bought all the ingredients from the local health store and farmers’ market. The store assured me ‘hemp seeds only come like this’ so we proceeded as they were. I think our pesto had a crunch of husk!!! Not ideal but tasted nice and we laughed a lot. Our search for hemp without husk continues. Fun afternoon and dinner. This looks delish! I am going to try it next week! Can you suggest what I would substitute tomatoes for? I can’t eat tomatoes and peppers (due to allergies). Thank you for sharing this delicious recipe! Hi Dana, I haven’t tried this yet, but you could probably omit the sun-dried tomatoes in the pesto if need be! You just might need to tweak the other ingredients to taste. I hope it turns out for you, please let us know! I kind of messed mine up. I cooked the asparagus too long and in my rush to shovel this wonderfulness into my mouth, I completely forgot the peas. It was amazing even with my mistakes!!! I will experiment with zucchini noodles and maybe steam the carrots just a touch. I also sprinkled a little bit of the hemp seeds on top. Just yummy! Thank you for another wonderful recipe. I’m glad it turned out well, Dani! This recipe is amazing!!! And super easy! I normally like to follow recipes exactly how it is but this time i did some things slightly different. I added celery, as I had some on hand. Added a little extra of all the veggies to make a bigger batch. To make a little extra sauce I added entire jar of sundried tomatoes, extra garlic clove, alittle extra water, and 1/2 cup of hemp seeds. Made perfect amount and made it extra saucy! I drained most of the oil out of sundried tomato jar, just because I didn’t want so much oil. Bought pre shredded carrots, they are called ” Match Stix” on the bag. Saved time and went perfect with the meal! And lastly I used grapeseed oil instead of olive oil! Absolutly delicous!! I was looking for a salad type recipe that I could make for just my boyfriend and I as part of our bbq dinner Sat night and then bring to a picnic lunch (for 4 of us) Sun. 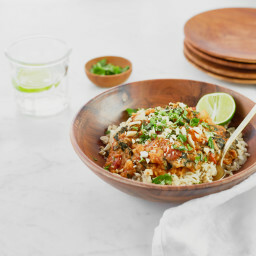 Would this work if I double (or triple) the recipe, cook it all Sat night, store the leftovers separately (veggies and pesto) and then bring it to a picnic lunch on Sun? This was absolutely delicious. I honestly wasn’t sure how good it would be as it was just so veggie heavy (and I’ve veggie averse!). But, we are trying to be healthier and eat more vegetarian dishes and I thought the recipe sounded interested. We were blown away by all the flavor! So glad to have stumbled across this blog. I was tickled to see this recipe in this week’s Oh She Glows Newsletter since it was the first recipe I made when I crossed over to the plant-life. It was so fresh, easy and delicious – it changed my view of vegan food and made me an instant OSG fan. I serve mine over brown basmati rice but I think you could serve this over anything and it will still be super yummy. Thank you for all your amazing recipes Angela. They have been creating many of my meals for the past 2 years. Thanks so much for taking the time to leave this lovely comment, Janet! You brought a huge smile to my face. For just the green saute (without serving on carrots), would this be good served as a chilled side dish? I love this recipe so much. This is one of the first OSG recipes that I tried years ago for a group of people. Its amazing. Everyone loved it, even the carnivores. I just want to say to Angela, keep up the amazing work. I have both of your books which (of my EXTENSIVE cookbook collection) are two of the three jewels that have a permanent home on my counter. Your recipes have really made my life easier, especially in pleasing those friends and family members that are convinced that healthy means boring! I make this with spaghetti squash— YUM! Just made this tonight – over zoodles! Added in chickpeas for a bit more protein. DELISH! This is delicious and have made it a number of times. The pesto flavor is to die for!!! I actually crave the flavor of this dish. Not complicated to make, so go ahead & give it a try ladies/gents. 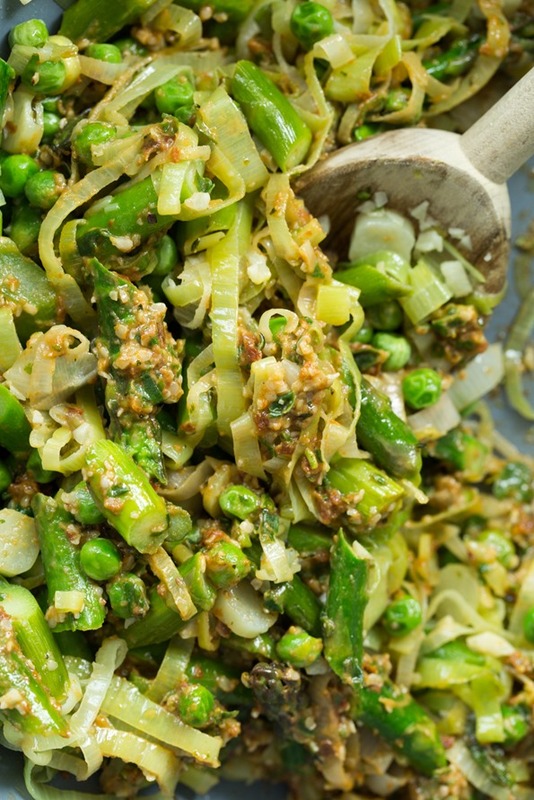 Why can’t I find this recipe Glowing Green “Pasta” Primavera on the app? Hi Renata, Not every recipe from this site is on the app, but we’re adding as many as we can overtime. Thanks for the suggestion! Previous post: 23 Vegan Easter Menu Ideas: Salads, Sides, Entrées, Treats, & Brunch!